This product was added to our database on Saturday 7 March 2015. The Avro Anson was a British twin-engined aircraft that served with the RAF, Fleet Air Arm and some Commonwealth Air Forces before, during and after WWII. Developed from the Avro 652 airliner, the multi-role Anson Mk I was originally meant for maritime reconnaissance but after becoming obsolete in this role, it was found more suitable as a multi-engined aircrew trainer. It took its first flight in 1935, entered service in 1936 and was finally retired from the RAF as late as 1968. Over 11,000 were produced between its introduction in the 1930s and the end of production in 1952, just over 8000 in the UK and the remainder in Canada. 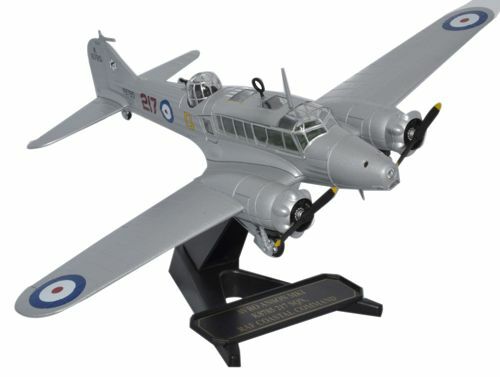 Our model is based on an aircraft that served with the RAF before the War and comes in silver grey satin finish with RAF markings on the upper and lower wing tips and on both sides of the fuselage. Its number K8785 is printed on the underside of each wing, on the tail fin and also on the fuselage. The squadron number 217 is also reproduced in red on the fuselage. Propeller blades, engine, machine gun and DF Loop are all painted black, the oil coolers are dark grey and within the clear canopy, you can see the interior moulded in a muted sage green colour. Added detail sees the propeller tips painted yellow and the exhaust pipes a rusty shade of brown.